Mix the all purpose flour, gram flour (besan), corn flour,yogurt, oil(1/2 tsp), and color together. Set the batter aside in a warm place for one hour.By then the batter gets fermented. In a pan boil sugar and water for 15 to 18 mins to form sticky syrup. Add the lemon juice,cardamom powder and saffron and keep on low heat. After one to 1 and 1/2 hour the batter will get fermented,so now we can make the jalebi's. For that heat the oil in a wok.The heat should be medium hot and once at that point reduce it to medium low. Fill the Jalebi batter into a piping bag/ketchup bottle . Fry the Jalebi's crispy for few minutes on both sides. Let jalebi soak in the warm syrup for a few seconds and take out. 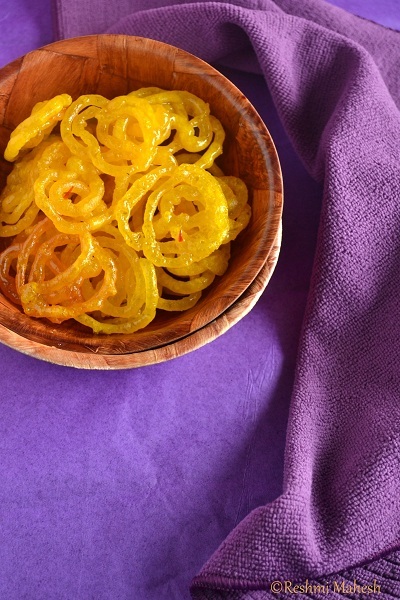 1.After fermenting batter will be smooth.The batter should have medium thickness,else jalebi's would become too thin and crispy. 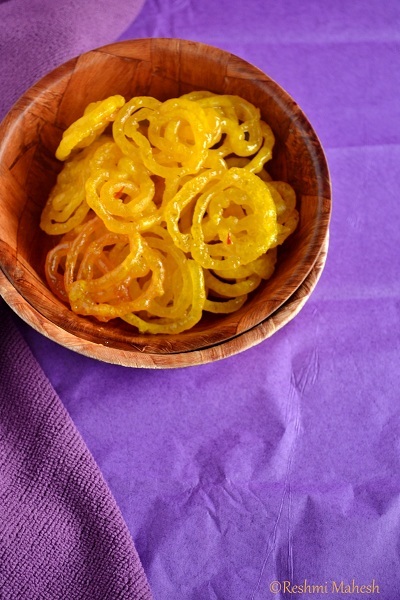 2.Don't soak the jalebi's for more time.That makes them too soft by absorbing too much of syrup. Thanks for visiting my blog. The jalebi looks nice and crispy. 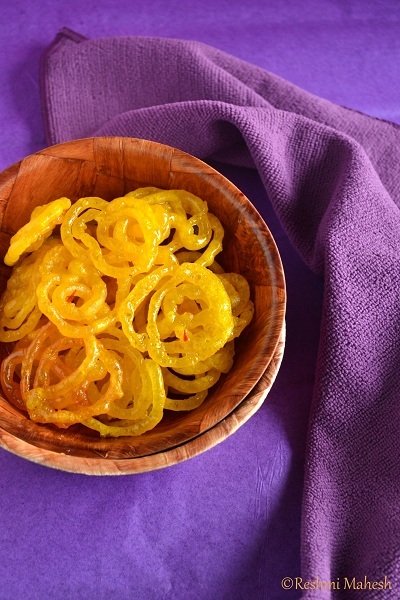 nice looking jalebis and they are my all time favourite ! loving it ! Those look really cool, especially like the color! Very yumm & delicious jalebis,loved it! !